The following post appeared on BAH on 10 August 2009. In the kitchen, timing is everything. Food is done when it’s done. You get a little wiggle room with some dishes. Others are not so forgiving. Worst of all is when you’ve unknowingly overcooked something. Like that time I made baked eggs. I was expecting something along the lines of maybe a soft boiled or poached egg. What I got was tough and rubbery. Seriously, my fork kept bouncing off the whites as I tried to cut into them. I did not pay attention to a cardinal rule of cooking – timing involves more than watching a clock. Yes, paying attention to how long a recipe says it will take is important. But so is paying attention to how it smells and looks. Every time SFC is cooking, I try and explain not to just go by how many minutes are on the timer but to use all the senses. Clearly, I need to remember my own words. I scaled the recipe to make two servings. If I can get this to work they way I think it’s supposed to, I bet it would make a great brunch dish or an easy weeknight dinner. Preheat oven to 350 degrees. Set two 12 ounce ovenproof bowls on a large rimmed baking sheet. In a large saucepan, heat oil over medium flame. Add garlic and rosemary; cook, stirring until garlic is golden, about 2 minutes. Add diced tomatoes with juice, crushed tomatoes, and 2 tablespoons parmesan. Bring to a boil, reduce heat and simmer, stirring occasionally until slightly thickened, 2 to 4 minutes. Season with salt and pepper to taste. Divide tomato sauce between bowls, reserving 1/2 cup. 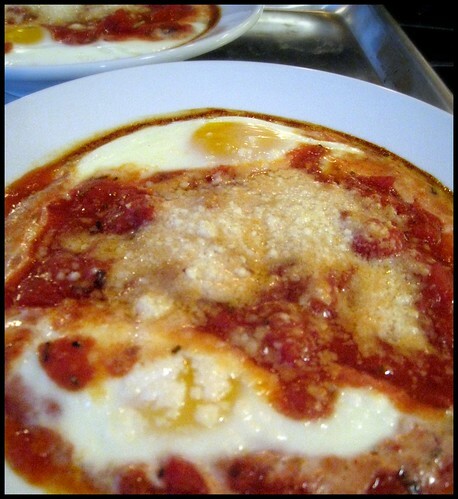 Crack 2 eggs into each bowl and top with reserved sauce and 2 tablespoons parmesan. Bake until egg whites are just opaque, yolks should still be soft, 24 to 28 minutes, rotating sheet halfway through.